Introduction Gastric cancer is one of the most common cancer globally, particular in Asia such as China, Japan and Korea. Although the prevalence of gastric cancer is not nearly as high in the United States as in Asia, the U.S. population tends to present with more advanced disease and have a worse prognosis than the Asian counterparts. The treatment armamentarium indeed differs widely between regions. Currently, gastrectomy remains the standard of care in the treatment of gastric cancer. While the natural history of gastric cancer in the U.S. markedly differs from that seen in Asia, the U.S. experience with gastrectomy techniques is beginning to parallel with those seen in Asian countries. 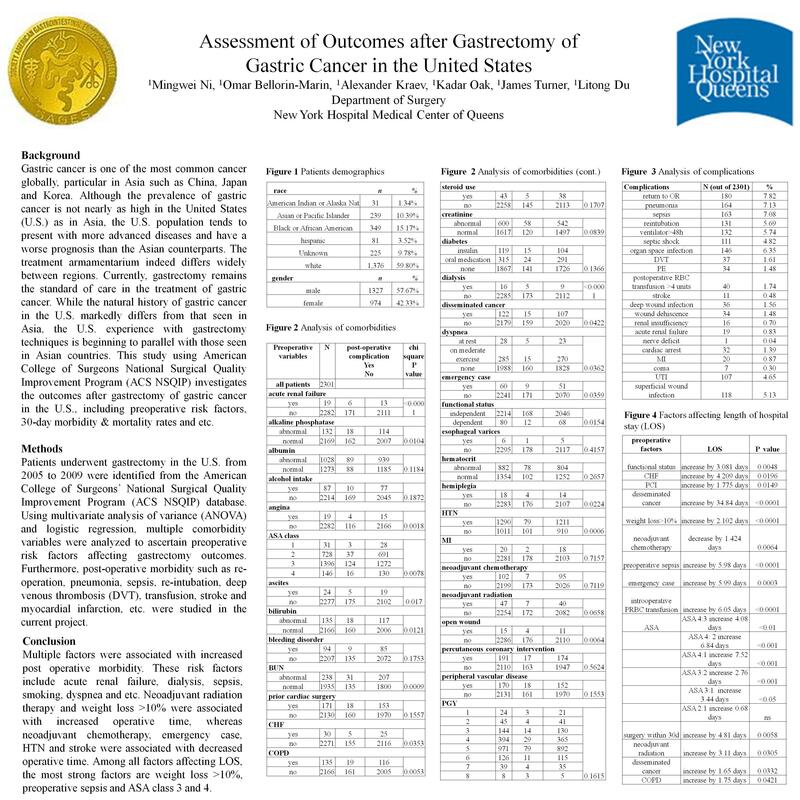 This study investigates the outcomes after gastrectomy of gastric cancer in the U.S., including preoperative risk factors, morbidity and mortality rates. Methods Patients undergoing gastrectomy in the U.S. from 2005 to 2009 were identified from the American College of Surgeons’ National Surgical Quality Improvement Program (NSQIP). Using multivariate analysis of variance (ANOVA) and logistic regression, multiple comorbidity variables were analyzed to ascertain preoperative risk factors affecting gastrectomy outcomes. Post-operative morbidity such as re-operation, pneumonia, sepsis, re-intubation, deep venous thrombosis (DVT), transfusion, stroke and myocardial infarction, etc. were further studied to in this project. Results Total of 2301 patients were recruited in the current study. The morbidity and mortality was 22.38% and 3.78%, respectively. The mean operative time was 219±100 min. The mean length of hospital stays (LOS) was 11±10 days. Current study has identified multiple risk factors associated with increased LOS. For example, compared with independent status, dependent functional status was associated with a 3.081- day increase in LOS (p= 0.005). Preoperative CHF was also associated with a 4.209- day increase in LOS (p=0.0196). American Society of Anesthesiology (ASA) class 4 patients had a longest LOS. Compared to class 1 patients, class 4 patients was associated with a 7.52- day increase in LOS (p<0.001). Conclusion Multiple factors were associated with increased post operative morbidity. These risk factors include acute renal failure, dialysis, sepsis, smoking, dyspnea and etc. Neoadjuvant radiation therapy and weight loss >10% were associated with increased operative time, whereas neoadjuvant chemotherapy, emergency case, HTN and stroke were associated with decreased operative time. Among all factors affecting LOS, the most stronge factors are weight loss >10%, preoperative sepsis and ASA class 3 and 4.